I actually started writing this some time ago. I had completed an entire review, with a number of references and dialogue bits thrown in for good measure. Then wouldn’t you know it…the computer crashed. Of course, while that is not something that has never happened, it does give rise to the term ‘buzzkill’. That also gave rise to this word: eureka! 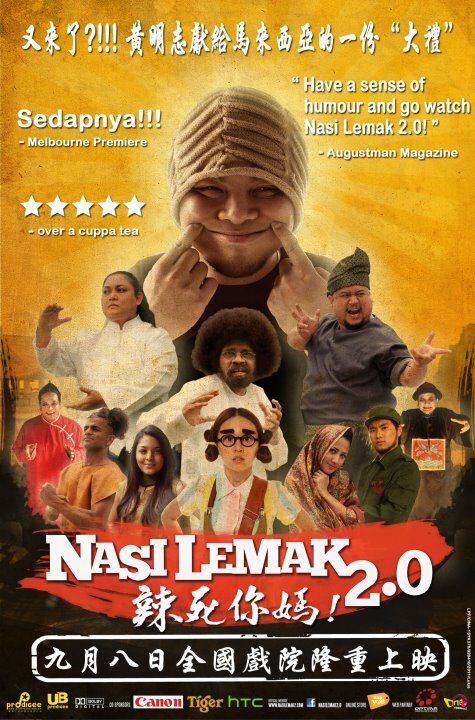 For while I have been largely impressed with Namewee’s debut effort as a full-fledged filmmaker, I came to realise that buzzkill was probably the best word I could think of to describe ‘Nasi Lemak 2.0’. Reason number one is fairly technical. I had purchased the film on DVD. One day a study will be done on whether the shortening of the window from theatrical to DVD release helps or detracts a film’s overall takings. For my part it has done more of the latter (I feel less desperate to watch a film at the cinema, knowing that I can catch it very soon anyways), but my approach to watching many films these days is slightly different. I prefer watching a movie several times and have no compulsions to keeping a copy of my own for future (academic?) use. There was something I didn’t like about the DVD, though. On the top left hand side of the screen is a logo of Sendi Mutiara, the company distributing the DVD. I understand commercial obligations, but there must be a better way of expressing them than plastering it on the screen practically throughout the whole film. 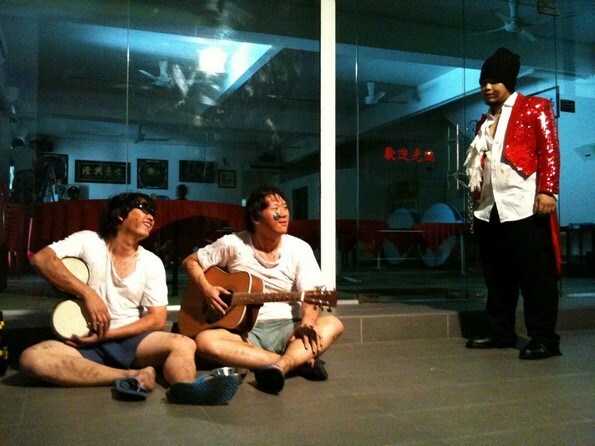 It pales, however, in comparison to the logo of Namewee’s production company. This was positioned over the right hand corner, and it actually got in the way of the mise en scene on several occasions. At one point, it even covered the face of one of the characters. Once again, I understand commercial considerations, but unless Namewee’s company came to an agreement with…well, himself, I see no good reason for this other than stroking his own ego well and proper. It could be argued that given this is a film that was written, directed and starring the man himself (the poster even had the almost-obligatory ‘A film by Namewee ‘tag; once again, a future paper will probably consider the worth and value, commercial, artistic or otherwise of such a marketing tagline in Malaysian films). How much can the non-diegetic influence the diegesis? It’s not entirely appropriate in a way, given that this film cannot exist without people having the correct amount of cultural capital to make the intertextual references required for a more wholesome experience. The film follows Chef Huang (Namewee) as he tries to learn a secret recipe to improve his business. Not only that, he meets Xiao K (Karen Kong), whose father’s restaurant will be taken away from him unless he can best his sister and her cook, Lan Qiao (Dennis Lau) in a cook off. Cajoled into cooking for her father, and fueled somewhat by his personal rivalry with Lan Qiao, he agrees to listen to imaginatively-named Kak Noor (Adibah Noor). She reluctantly helps him, setting him off on an adventure throughout the country to learn the best local recipe. It is in Bantin that he meets the Curry Master (David Arumugam) and his daughter, Curry Daughter (Nadine Ann Thomas), and where we pick up our previous point. Putting aside the question of how on Earth did a girl from Bantin pick up the kind of proper English that would make even the most hardened of the Korean diaspora jealous, there was a running gag of her being strongly encouraged to enter the Miss Malaysia Universe contest. Of course, this would only be fully understood if you did know that she was indeed a winner of the said contest. Not that the chance to have a dig at it was passed up, though: “I decided to stay here in Bantin to help my father.” “Yeah, I also want to bring about world peace.” Or something to that effect. The truth at last: Hang Tuah does exist! Of course, such considerations should only be considered momentarily, at least because it’s not a film that aims to provide hardened statements about stereotypes. It is a comedy that aims to provoke (witness the insertion of lyrics somewhere along the lines of Chinese people should only ever eat Chinese food). It may even intend challenge or push certain social idioms (such as the national questions brought up by some of the minor characters: “If Malaysia is playing china, who do you support?”). There’s plenty more where this is from, but I’ll leave that for you to find out. For the most part, however, the film displays a juvenile sense of comedy, one that makes this (re)viewer whether they challenge or solidify. I laughed at the “Walaowei!” moments, but fail to do so at the assertion that Indians can be found hiding behind trees and bushes. I roared when he got hit on the head by David Arumugam for stating at his daughter: “Don’t hit me, your daughter’s hot!” However, my reactions were more muted with the ridiculous bouncing bellies, or one character’s proclamation for a communist country by donning a cap with the red star and walking off with his wife and child in tow, a perfect poster family the Chairman would have been proud of. The apparent changes in character by the Chef (into Hero Huang) also confuses at times, making me wonder about their direct or indirect relevance to the actual story in the film. Have you heard the one about the magician and the buskers? The reaction to this film, however, has been overwhelmingly positive. Box office-wise, it made a tonne of money, which made me wonder why. Coming back to the term ‘buzzkill’, I do not wish to be one but I am reminded of a previous 8TV campaign during Ramadhan last year, which provoke a huge uproar over its apparently-negative portrayal of Chinese people. Here, I see negative portrayals of many different kinds of people, yet it is very popular and well-received. While they are not the exact same things, I do see the spirit of fun and satire clearly at play both here and there. I wish for everyone to be more open-minded and considerate when it comes to such works of the arts. This film deserves to be seen and judged on its own merits, because I believe it is the kind of film that deserves to be read on a deeper level. Further viewings may even surprise you (if you can bear with the dodgy DVDs; it even skips at several parts of the film, which is most annoying), for it may also force you to reconsider certain things held true by many. Conversely, it could do the opposite (is the film that different from a ‘1Malaysia’ or ‘Malaysia, Truly Asia’ promotional effort? In other words, does it really break new ground in such constructions? ), but I suppose that would depend on you and the cultural capital and links you are able to make. After all, it’s not only the Indians who can make curry.